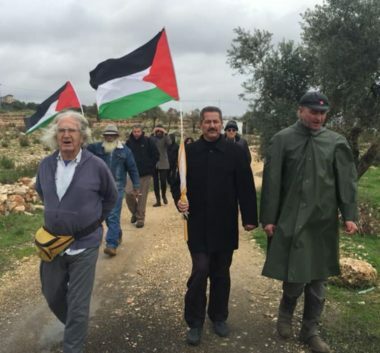 Israeli soldiers attacked, Friday, dozens of Palestinian, Israeli and international peace activists, holding the weekly nonviolent procession against the illegal Annexation Wall and Colonies, in Bil’in village, west of the central West Bank city of Ramallah. The nonviolent protesters marched from the center of the village carrying Palestinian flags, and chanting for national unity, ongoing resistance against the Israeli occupation until the liberation of Palestine, the release of all detainees and the Right of Return of the refugees. They stressed on the importance of remaining steadfast, and the continuation of popular resistance against the illegal Israeli occupation, and its apartheid policies. 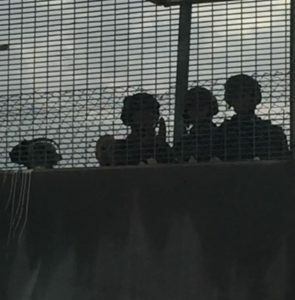 The Popular Committee against the Annexation Wall and Colonies in Bil’in said the soldiers fired gas bombs and concussion grenades at the protesters, and chased many of them but were unable to detain any of them.